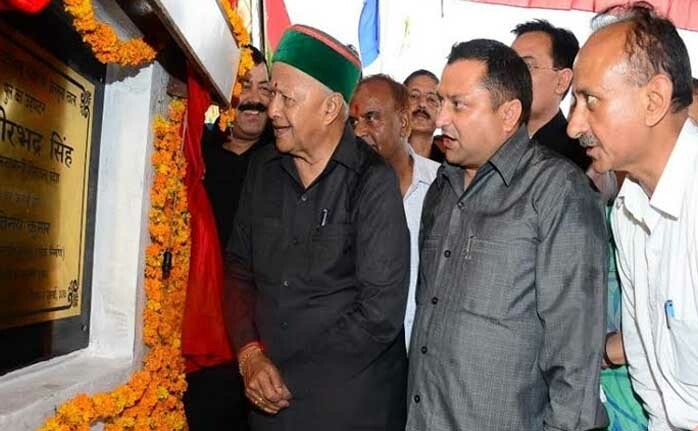 Shimla : The Chief Minister of Himachal Virbhadra Singh, who reached Nahan by road today from Shimla amidst continuous rainfall today laid foundation stones of various development projects worth Rs. 21.20 crore and inaugurated works worth Rs. 15.15 crore, which includes foundation stone of college building at Banog near Nahan to cost Rs. 20.38, foundation stone of Flood Protection works of Kothron Khud to cost Rs 81 lakhs, inauguration of Government Polytechnic Building at Rampur Banjaran near Paonta Sahib, completed with an outlay of around Rs 12 crore and inauguration of Rs 3.57 crore bridge over Jalmusa rivulet at Kolar. Chief Minister said that selection of site for development of projects, especially educational and health institutions should be done with utmost care as government spends a lot on construction of these institutions. He said that Polytechnic site at Rampur Banjaran would involve more expenditure for constructing a bridge and erecting crate wall all around the building to protect it from floods. The Chief Minister said that instead of ESIC Hospital in Rampur Bharapur a new Primary Health Centre would be made functional. He announced Primary School at Ghunghlon-1 in Rampur Bharapur Gram Panchayat, upgradation of Primary School Mehrar Majri to Middle School, up-gradation of Middle School Parduni to High School in GP Parduni. He also announced providing land for ‘Burial Ground’ in Rampur Banjaran for Muslim community and directed the PWD to prepare estimates of the link road connecting village Doiyan-Wala-Ghunghlon-1 to Kheri. He also directed to speed up the construction work of bridge over Sunkron rivulet which connects entire Paonta-Kyarad-Doon valley to Renuka area. He also announced construction of bore-well and over-head tank in Ward number nine of Rampur Bharapur. He also directed the department to identify the remaining portion for channelising of Sunkar Khud and its tributaries for flood protection. He said that the NDA Government at the Centre had failed in all fronts and had failed to fulfill the promises it had made to the people of the country. He said that common man has been affected severely as the prices of all essential commodities has increased manifold. ‘What type of ‘Achche Din’ are these when the prices of pulses have gone up from Rs 100 to Rs 140 per kg and the prices of petrol and diesel and other essential commodities has also increased,’ he quipped. He said that the Land Ordinance Bill was aimed at depriving the common man from their lands to facilitate big corporate houses. 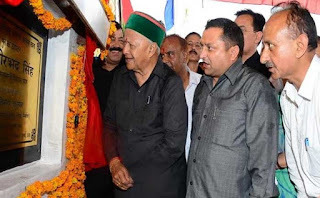 He said that that the Government of Himachal Pradesh was still providing three pulses, edible oil and iodized salt etc at subsidized rates, thereby bearing burden of Rs. 250 crore annually so that the people of the State may be provided them essential commodities at subsidized rates. He said that the prices of petrol and diesel had gone up considerably.